Feel the stress of the hustle and bustle of the city life slowly fade away the moment you enter the door of Creekside Serenity. 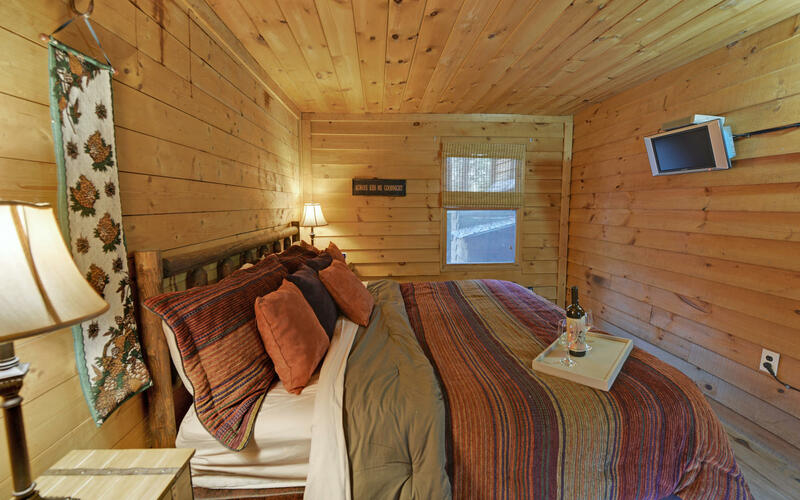 This beautifully decorated North Georgia Mountain Cabin is truly a waterside haven. 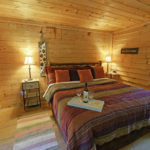 The perfect romantic destination for the folks that need some quality alone time. 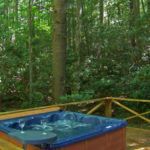 A time to unwind, have an adult beverage, soak in the hot tub, maybe read a book while listening to the babbling brook. Roast s’mores over the creekside fire-pit. 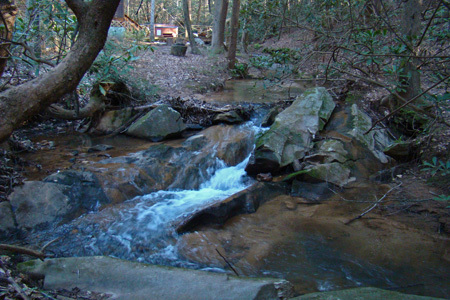 You’ll soon realize why it’s named Creekside Serenity. 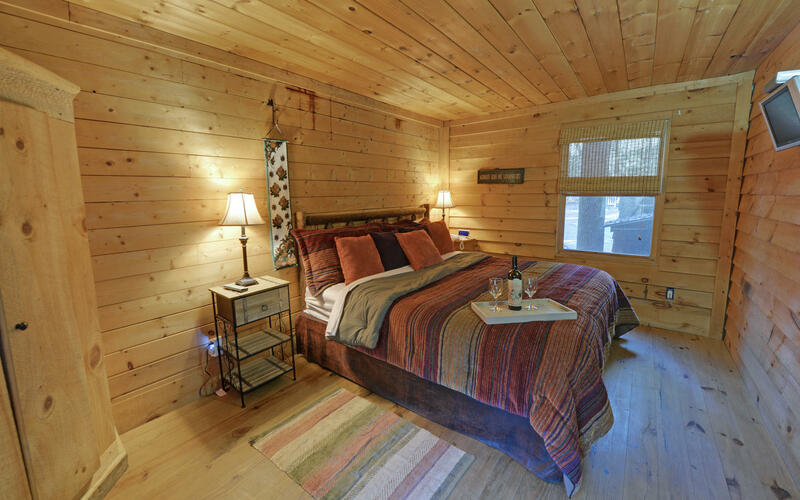 To check on availability for Creekside Serenity, click on this link “CHECK AVAILABILITY”, or call us Monday through Friday from 09:00 AM to 05:00 PM, EST at (866) 666-2224, or email us at relax@slidingrockcabins.com. We attempt to respond to all email inquiries within 48 hours. 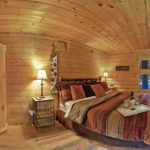 Standard nightly rates for Creekside Serenity, start at $125 per night. 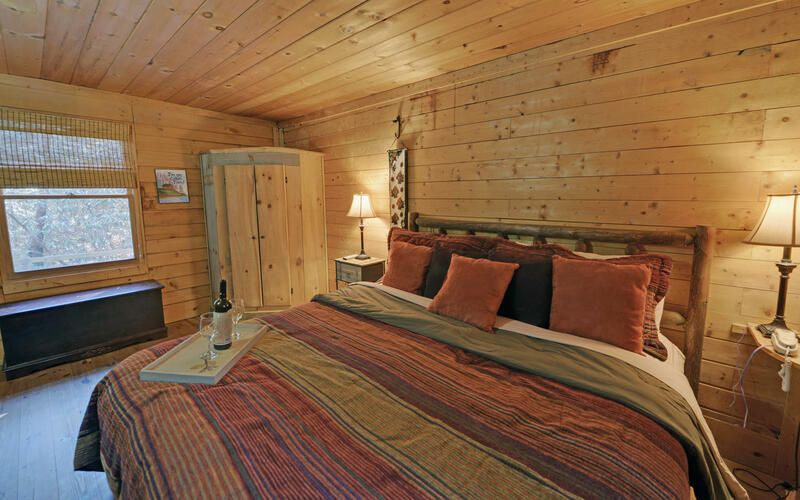 Weekly discounts apply for reservations seven (7) nights or longer. Higher rates apply for Peak and Holiday Seasons. 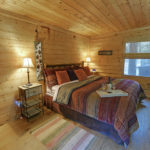 Mountain life at Creekside Serenity. 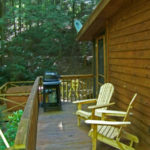 We enjoyed our stay at Creekside Serenity. 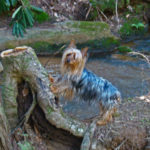 Our fur babies loved it and it was so accommodating for them. The gates and screened doors all had latches and the fenced in area was so nice. 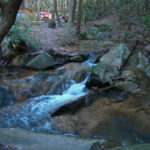 My favorite part was stepping out the back and being right on the creek with a nice fire in the fire pit. The only problem we had was the weather made driving a little tricky for us ‘of age’ folks. One night coming back from dinner, we were challenged with rain and heavy fog. I think we would have been fine had the weather cooperated. 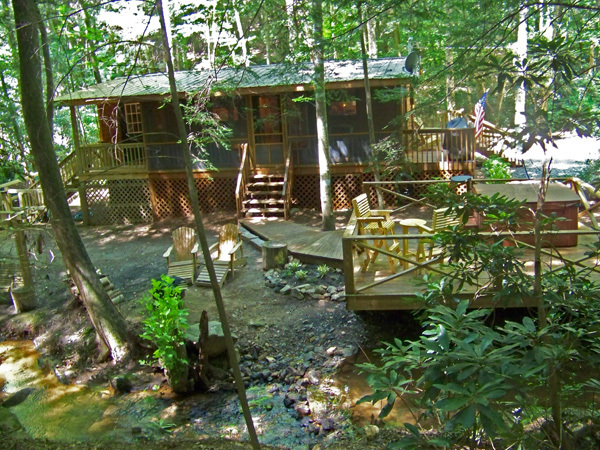 Regardless, we loved the place and will definitely rent through Sliding Rock Cabins in the future! 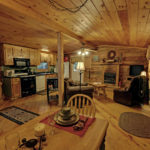 Cabin was perfect for us and our two labs. A dog area was a pleasant surprise for us to let our pets out for their nature calls. 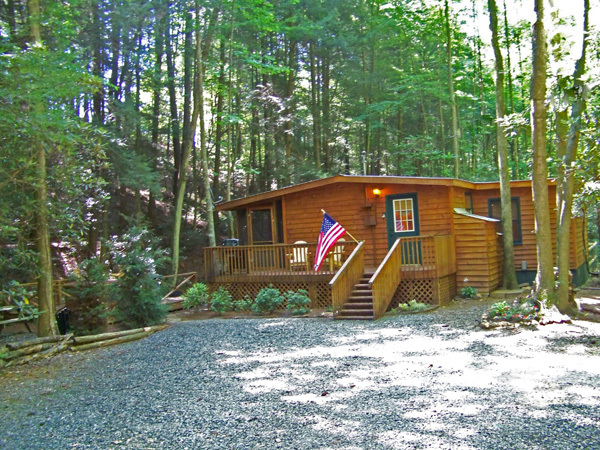 Clean cabin, and the area was beautiful with the creek running next to cabin. 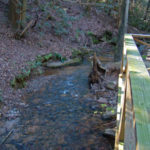 Great walks. 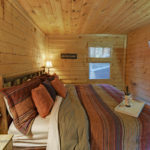 We had a wonderful week stay in this cute little cabin. 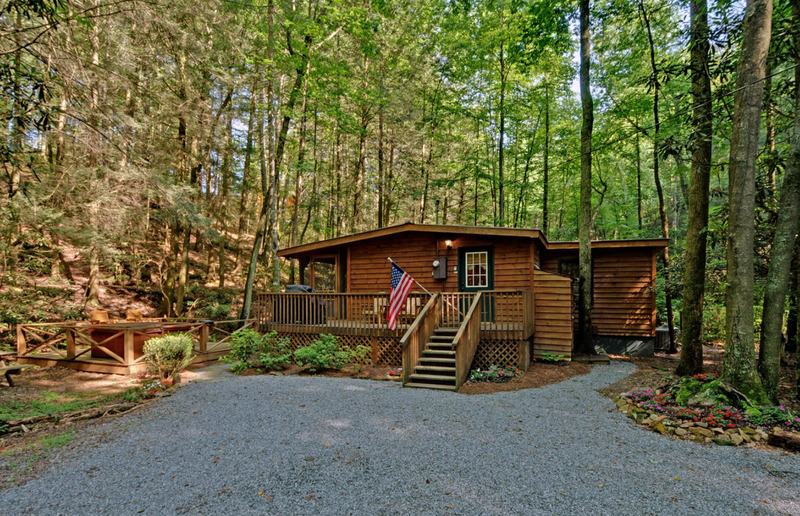 We wanted a cabin on a creek with a hot tub and this did not disappoint. It was very relaxing. 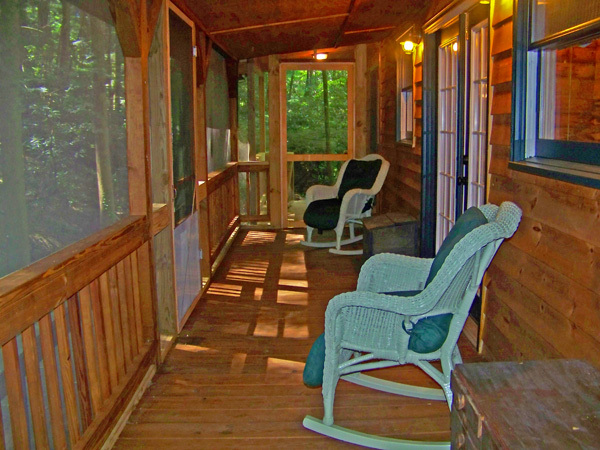 The cabin had everything you needed. The living room furniture could be a little more comfortable as I would have loved to snuggle watching a movie. Our doggies loved it too. We will be back!!! 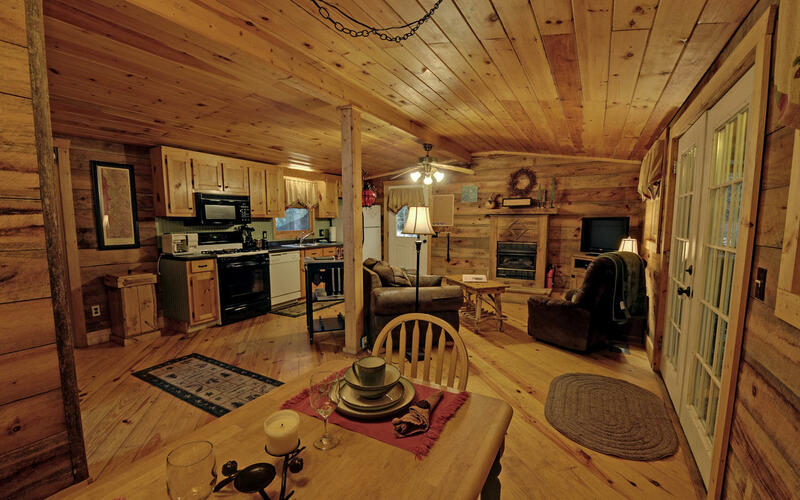 I've always preferred the ocean to the mountains, and then I came to this cabin. It was absolutely PERFECT for my long weekend getaway. Everything was exactly as shown on the website, minus the hammock (no longer there). 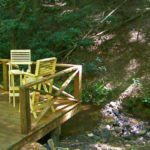 I found myself spending a lot of time reading in the swing beside the creek, relaxing and enjoying the peaceful setting. 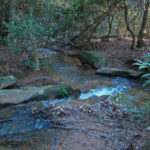 For the adventurous, cross the creek and hike a little ways to see some beautiful waterfalls. 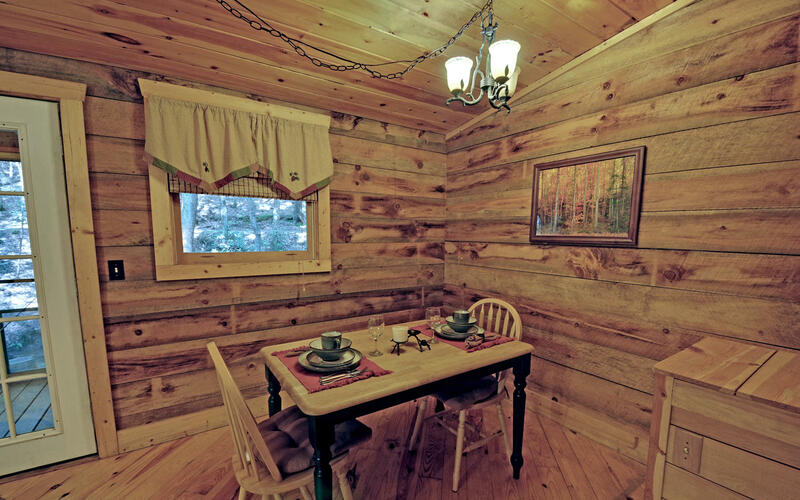 I've recommended this cabin to everyone I have talked to since returning home. 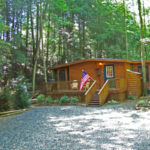 We have stayed at a lot cabins with Sliding Rock and Creekside Serenity is our favorite. We will be back soon. 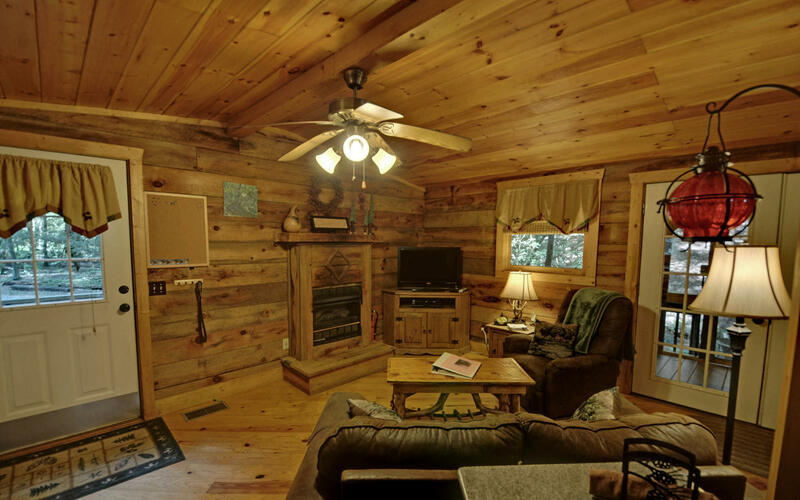 Cabin was very lovely. 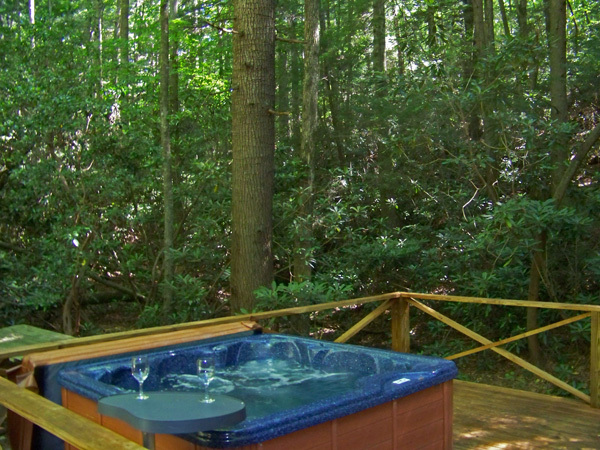 Enjoyed hearing the creek and the hot tub. We had a good time until the storm came through early Saturday morning. The power went out and after a short walk down the drive realized the power line was down and a tree was across the drive. After a further walk realized that the main power line into the area was down as were many trees. After talking to several people that had been cutting trees and clearing the road, we realized it would be a while before power was restored. We decided to try to make our way out a day early. after moving the tree, we were able to make our way out.Yes we will rent again. 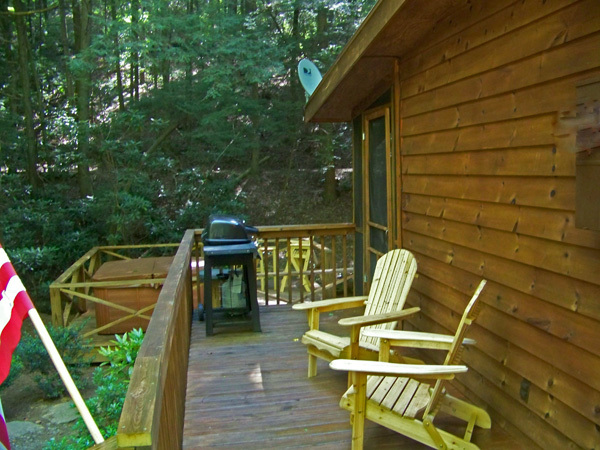 ...loved the location -- beautiful forest and creek...nice, cozy cabin -- rustic but the woods are rustic, too. Wow! This place was perfect for us. We needed a place where we could be alone with our thoughts and enjoy the peace with nature. 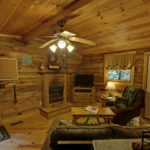 The cabin was clean and cozy and had everything we needed. 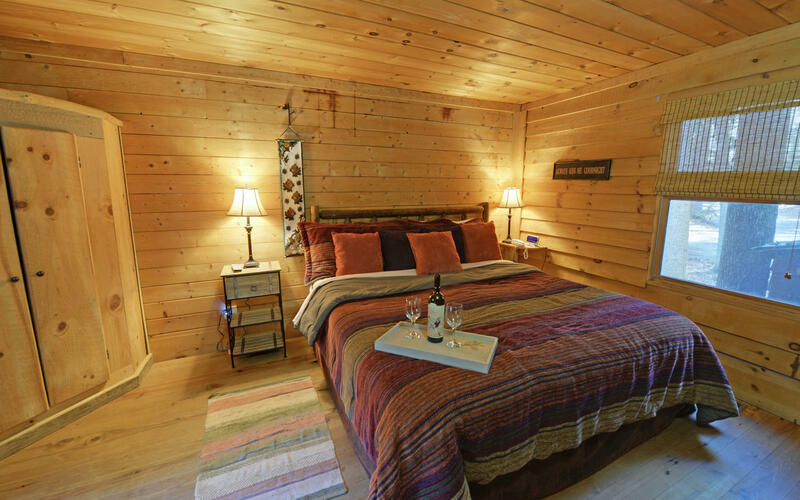 We had stayed at another cabin which was wonderful but for us this one is now our favorite. 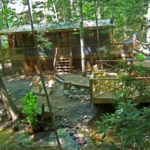 It is secluded and quiet and we loved the hot tub at night with the creek running next to it. 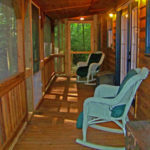 Every morning we would sit in the rockers on the porch while we had our coffee. 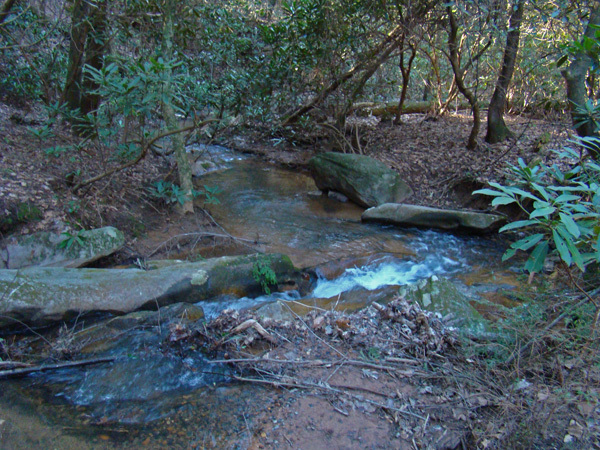 You could feel the stresses leave your body as we listened to the birds and the sound of the creek. 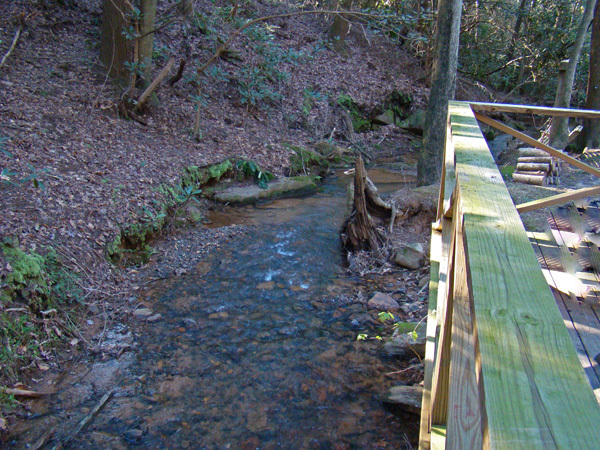 At night you can turn on lights under the deck to light up the creek. We didn't eat in town this time but we did go exploring and checked out the Chief Vann House. 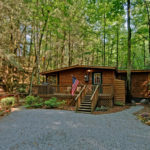 Our stay was wonderful and would recommend this cabin if you are looking for a peaceful place to unwind. We will stay here again. I wish I could give more than 5 stars! 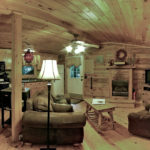 We had such an amazing time, the cabin was perfect down to every little detail. 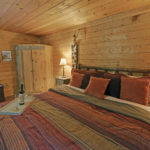 We felt right at home and were able to really relax and enjoy our time. 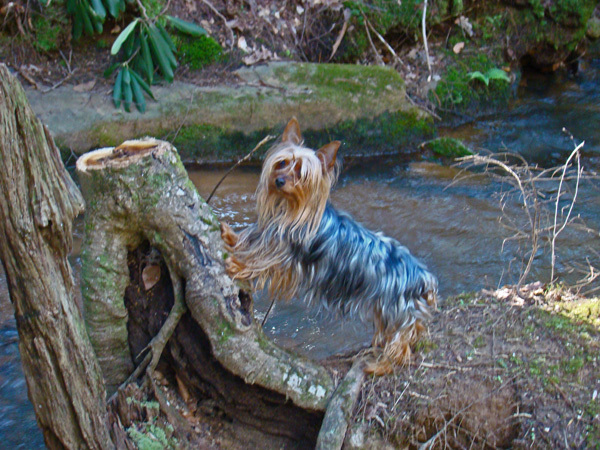 Our dog had a blast and loved exploring. 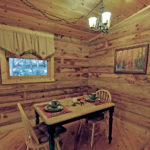 It was in a perfect location, the cabin was so cute and nicely decorated, and perfectly tucked away. 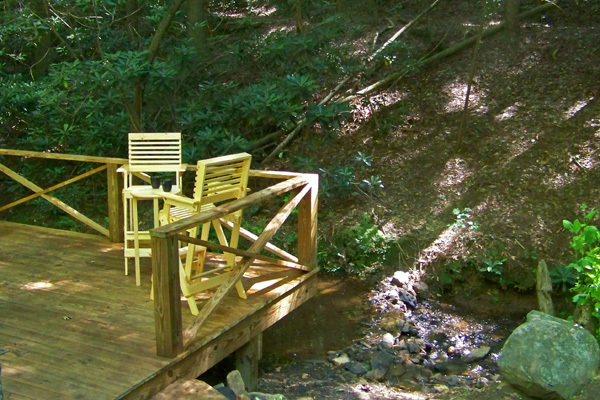 I cannot wait to book another stay at Creekside Serenity.